The final stop on the 2017 World Surf League (WSL) Championship Tour (CT), which holds a competitive window that opens tomorrow Friday, December 8 and runs through Wednesday, December 20, 2017. The highly-anticipated final event on the men’s CT will decide the next Billabong Pipe Master as well as serve as the final stage of the Vans Triple Crown of Surfing, concluding the prestigious three-event series and crowning a winner. 2016 WSL Champion Florence comes into the event wearing the coveted Jeep Leader Jersey and is ready to defend his World Title at the Billabong Pipe Masters. The 25-year-old sits only 3,100 points ahead of 2014 WSL Champion Medina and will look to get a strong start at the last event of the season. All eyes will be on Florence as he hunts down a Final berth to clinch the World Title and carve out his place in surfing history. Florence will battle Wiggolly Dantas (BRA) and the winner of the Pipe Invitational trials event in Round 1 Heat 6. 2014 WSL Champion Medina looks in great form to play spoiler for Florence heading into the season finale at Pipe. Medina, 23, has had strong results at the Billabong Pipe Masters (2nd in 2014 and 2015) but has yet to lock in a CT event win at the famed Banzai Pipeline. The Brazilian will look for his breakthrough result and his opportunity to take home another World Title for Brazil. Medina will be up against Miguel Pupo (BRA) and the Pipe Invitational winner in Heat 5. Smith sits in third place on the Jeep Leaderboard after an incredible season that saw him wear the Jeep Leader Jersey for much of 2017 thanks to a win in Bells Beach and a runner-up finish at Trestles. The two-time CT runner-up (2010 and 2016) is on the hunt for his maiden WSL Title and will be looking to bounce back from two 13th place finishes and score a big result in Hawaii. Smith will face veteran Bede Durbidge (AUS) and 2017 CT Rookie Ethan Ewing (AUS) in Round 1 Heat 4 of the Billabong Pipe Masters when competition gets underway. Wilson, winner of the 2014 Billabong Pipe Masters, is also chasing down his first World Title and, after a win in Tahiti and a runner-up finish in Portugal, he’s in the position to do just that. Currently No. 4 on the rankings and less than 10,000 points behind Florence, Wilson needs to win the event to take the Title. The Australian will face off against recent Vans World Cup of Surfing winner Conner Coffin (USA) and compatriot Stuart Kennedy (AUS) in Round 1 Heat 3 when competition commences. For 35 years, the Vans Triple Crown of Surfing (VTCS) has been sharing and celebrating one of the most significant sporting series in the world. The VTCS encompasses three different and equally storied wave venues along seven miles of hallowed coastline – Haleiwa Ali‘i Beach, Sunset Beach and Pipeline. The first gem of the series, the Hawaiian Pro at Haleiwa, saw current World No. 9 Filipe Toledo (BRA) earn the win. 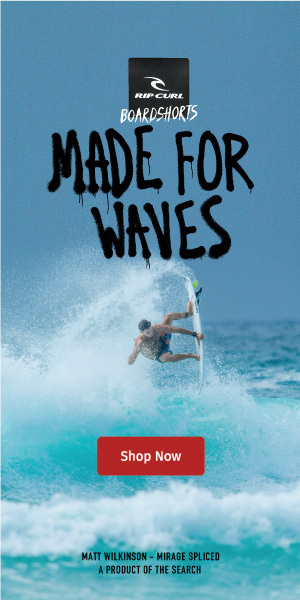 Conner Coffin (USA), currently in his sophomore year on the CT, won the Vans World Cup of Surfing at Sunset Beach and became the first Californian to do so. Now, the three-event series heads into its final event, the Billabong Pipe Masters, which will determine the prestigious VTCS winner. 32 of the best Pipe surfers from Hawaii and around the world will battle it out at the Pipe Invitational for a chance to compete alongside the WSL Top 34 at the Billabong Pipe Masters and claim the final two positions in the draw. The event features a $60,000 USD total prize purse, of which $5,000 goes to the winner, and the top two finishers get a wildcard entry into the final CT event of the year (prize money dependent on event result). The event window for the Pipe Invitational begins on December 8, 2017.